Local elections can get ugly, but Edison, New Jersey’s school board elections just took it to the next level. This week, an anonymous campaign mailer appeared in residents’ mailboxes proclaiming, “Make Edison Great Again.” What is keeping Edison from being great already? All the Asians, apparently. 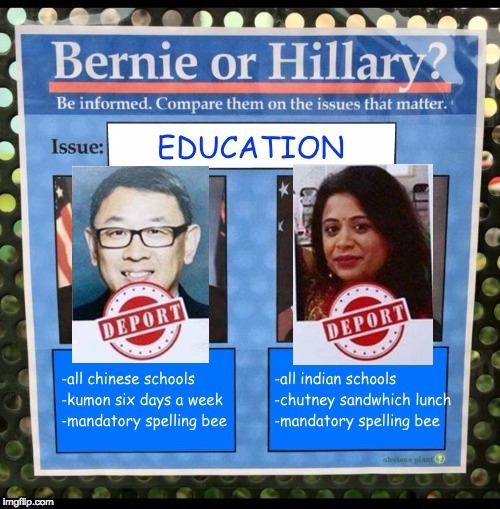 Some mysterious concerned citizens of Edison took it upon themselves to target Jerry Shi and Falguni Patel, two of the candidates for school board, as symbols of the supposed Chinese and Indian takeover of the township. The mailer, a cheap postcard featuring Shi and Patel’s faces with the word “DEPORT” stamped on them, lists some extremely mundane, essentially nonsensical concerns about this conspiracy to turn Edison into a no-whites zone. 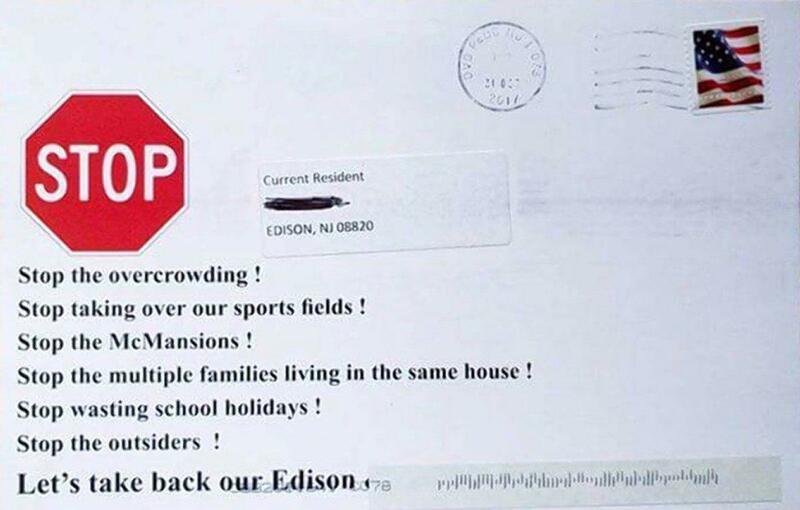 The reverse of the mailer lists just what’s wrong with Edison. Image source: New York Daily News. Cricket fields, which is to say any and all green fields, seem to be a huge issue keeping Edison from being great. As are McMansions, and whatever “Chinese Schools!” and “Indian Schools!” are. The mailer was roundly condemned by the city’s mayoral candidates, and several community organizations have planned a solidarity rally for Monday. There was no organization, or even a return address, listed on the postcards, nor has anyone come forward to claim responsibility in the wake of the heightened media spotlight on Edison. It would be nice to think the people who dropped this drivel into Edison’s mailboxes were too embarrassed to put their names on it, but that would assume the very unlikely chance that racists feel shame for their beliefs. It’s more likely they kept the mailing anonymous in order to slither away from culpability in case the authorities find cause to charge the act as a ‘bias crime.’ Law enforcement is currently investigating the possibility of doing so. While it’s important to always take a stand against incidents of hate and bigotry, the actual postcard itself is almost too stupid to merit real analysis. Who gets mad about “multiple families living in the same house” and “wasting school holidays,” honestly? Besides, Jerry Shi is running for reelection, so just in case the anonymous concerned citizens of Edison missed that last election–you lost.